The following Booking Conditions together with the General Information found on our website form the basis of your contract with Armstrong Global Ltd trading with the same denomination. Please read them carefully as they set out our respective rights and obligations. Please also go through our Errata List for any details that were printed incorrectly. In these Booking Conditions, "you" and "your" means all persons named on the booking (including anyone who is added or substituted at a later date). "We", "us" and "our" means Armstrong Global Ltd trading with the same denomination. A "package yacht charter" is a combination of at least two out of (a) transport, (b) yacht accommodation or (c) other tourist services (not ancillary to any transport or accommodation and forming a significant part of the arrangements) where booked through us at the same time, for which payment is made to us and which last at least 24 hours or include overnight accommodation. If you book a package yacht charter through us, once your package yacht charter has been confirmed we will accept responsibility for it in accordance with these Booking Conditions as an "organiser”. To make a booking, you must telephone our reservation department on 0203 529 6180 (from the UK) or 0039 02 320 625 424 (from Italy) or, where available, book via e-mail. The person making the booking will be deemed to be the party leader. The party leader must be at least 18 years old on the date of travel and must be authorised to make the booking on the basis of these Booking Conditions by all persons named on the booking. In making the booking the party leader confirms that he/she is so authorised. The party leader is responsible for making all payments due to us. You must also make the payments specified in Clause 2 at the time of booking. Once we have received your booking and all appropriate payments, we will confirm your arrangements by issuing a confirmation invoice and the yacht charter contract. This invoice will be sent to the party leader. Please check this invoice carefully as soon as you receive it. Contact us immediately if any information which appears on the confirmation or any other document appears to be incorrect or incomplete as it may not be possible to make changes later. In order to confirm your chosen yacht charter arrangements, a deposit of 50% of yacht charter fee only (or full payment if booking within four weeks of departure) must be paid at the time of booking. *Certain types of yachts may require a lower deposit. This may also apply to certain professional crew fees. This will be advised at the time of booking. The balance of the cost of your yacht charter arrangements must be received by us not less than four weeks prior to departure. This date will be shown on the confirmation invoice. Reminders will be sent via e-mail. If we do not receive all payments due in full and on time, we reserve the right to treat your booking as cancelled by you and retain all deposits paid or due at that time. If we do not cancel straight away because you have promised to make payment, you must pay the cancellation charges shown in Clause 6 depending on the date we reasonably treat your booking as cancelled. When we issue our confirmation pro-forma invoice to you, a legally binding contract comes into existence. We both agree that English Law (and no other) will apply to your contract and to any dispute, claim or other matter of any description which arises between us (except as set out below). We both also agree that any dispute, claim or other matter of any description (and whether or not involving any personal injury) which arises between us which we cannot resolve directly, must be dealt with under our Arbitration Scheme operated through the Chartered Institute of Arbitrators (if the Scheme is available for the claim in question - see Clause 12) or by the Courts of England and Wales only unless, in the case of Court proceedings, you live in Scotland or Northern Ireland. In this case, proceedings must either be brought in the Courts of your home country or those of England and Wales. If proceedings are brought in Scotland or Northern Ireland, you may choose to have your contract and any dispute, claim or other matter of any description which arises between us governed by the law of Scotland/Northern Ireland as applicable (but if you do not so choose, English law will apply). We reserve the right to increase or decrease the prices of unsold arrangements at any time. We also reserve the right to make changes to and correct errors in advertised prices at any time before your arrangements are confirmed. The price of your chosen arrangements will be confirmed at the time of booking. Once the price of your chosen arrangements has been confirmed at the time of booking, then, subject to the correction of errors, we will do our utmost not increase the price of your booking. However, in the event of cost increases due to international currency fluctuations or fuel price increases, we reserve the right to pass on such increased costs to you, up to a maximum of 5% of the holiday cost. Please note - you may be required to pay local taxes in specific countries such as arrivals tax in Turkey or National Park fees in Croatia or tourist tax in Croatia. We have no control over the cost of these and they do not form part of your holiday price or your contract with us. All yacht charter arrangements - please note, changes and errors occasionally occur. You must check the price of your chosen arrangements at the time of booking. Should you wish to make any changes to your confirmed yacht charter arrangements, you must notify us over the phone or via e-mail as soon as possible. Whilst we will pass on any such requests to the supplier concerned, we cannot guarantee any such requests will be met. Where they can be met, an amendment fee of £30 per booking will be payable together with any costs incurred by ourselves and any costs or charges incurred or imposed by any of our suppliers. Should you or any member of your party need to cancel your chosen yacht charter arrangements once they have been confirmed, the party leader must immediately advise us via e-mail or Royal Mail. Your notice of cancellation will only be effective when it is received in writing by us. If you do cancel, the following cancellation charges will be payable. Where the cancellation charge is shown as a percentage, this is calculated on the basis of the total cost payable by the person(s) cancelling excluding amendment charges. Amendment charges are not refundable in the event of the person(s) to whom they apply cancelling their holiday. 70 or more days before departure - Retention of deposit. 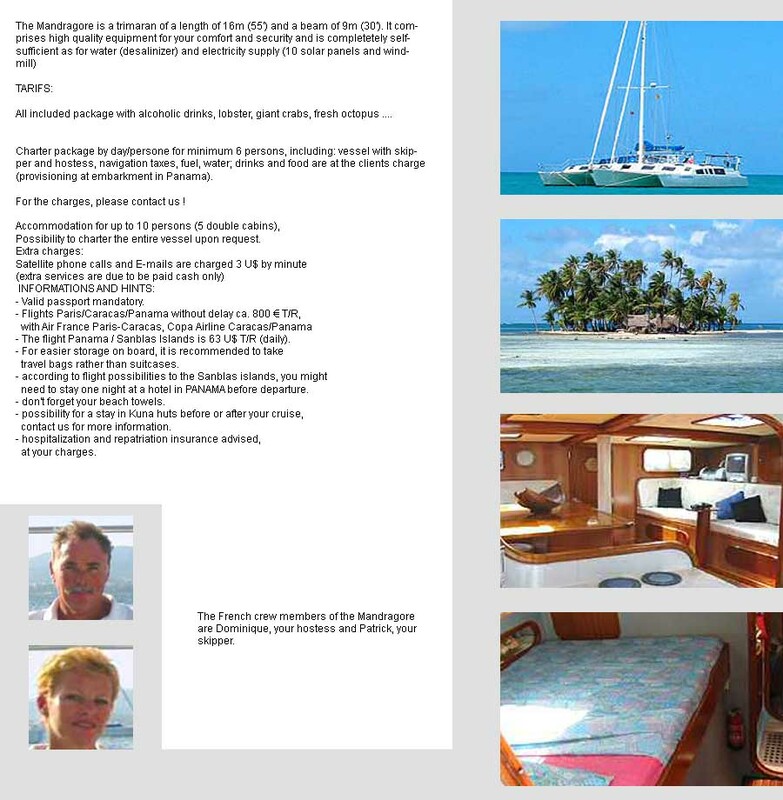 69-42 days before departure - 30% of total yacht charter cost. 41-28 days before departure - 50% of total yacht charter cost. 27-14 days before departure - 70% of total yacht charter cost. Less than 14 days before departure - 100% of total yacht charter cost. In the event your booking is replaced by another to the same yacht, your yacht charter cost payment may be refunded. If any member of your party is prevented from travelling, the person(s) concerned may be able to transfer their place to someone else (introduced by you) providing we are notified not less than two weeks before departure. Where a transfer to a person of your choice can be made, all costs and charges incurred by us and/or incurred or imposed by any of our suppliers as a result, together with an amendment fee of £25 per booking must be paid before the transfer can be effected. For private transport inclusive bookings, you must pay the charges levied by the supplier concerned. Please provide details of you personal travel insurance. This is highly advisable and all members of your party should be covered at least for medical expenses and travel cancellation events. 8. OTHER CHANGES AND CANCELLATIONS IF WE CHANGE OR CANCEL YOUR BOOKING. We start planning the yacht charter arrangements we offer many months in advance. Occasionally, we have to make changes to and correct errors in published and other details both before and after bookings have been confirmed. Although it is highly unlikely, we may also need to cancel confirmed bookings. Whilst we always endeavour to avoid changes and cancellations, we must reserve the right to do so. However, we will only cancel your confirmed booking ten weeks or less before departure, either where you have failed to comply with any requirement of these booking conditions entitling us to cancel, or where we are forced to do so as a result of force majeure as defined in Clause 9 below or other circumstances beyond our control.. Most changes to yacht charter arrangements are minor. Occasionally, we have to make a "significant change". Significant changes include the following changes when made before departure; a change of yacht to that of a lower official classification or standard for the whole or a major part of the time you are away, a change of sailing area for the whole or a major part of the time you are away, a change of outward departure time or overall length of time you are away of twelve or more hours. Please note, the above options are not available where any change made is a minor one. If we have to make a significant change or cancel, we will as a minimum where compensation is due pay you the compensation payments set out in the table below depending on the circumstances and when the significant change or cancellation is notified to you subject to the following exceptions. Compensation will not be payable and no liability beyond offering the above mentioned choices can be accepted where we are forced to make a change or cancel as a result of unusual and unforeseeable circumstances beyond our control, the consequences of which we could not have been avoided even with all due care. This includes itinerary changes due to weather and operating conditions, maintenance or technical problems with yachts or vessels or other transport. No compensation will be payable and the above options will not be available if we cancel as a result of your failure to comply with any requirement of these booking conditions entitling us to cancel (such as not paying on time) or if the change made is a minor one. After departure of flotillas or cruises, on occasion and due to unforeseen circumstances or circumstances beyond our control such as exceptionally bad weather, navigational restrictions or other operational difficulty, in the interests of client safety or comfort, the skipper or captain may make required changes to the itinerary at his discretion. Cancelling a port or ports of call or making required changes in the itinerary does not entitle passengers to any claim against us, or to any refund. If necessary, an itinerary may be changed or vessel substituted before or after commencement of the cruise. During the yacht charter, should the yacht or vessel sustain any breakdown in machinery or equipment disrupting the cruise itinerary for more than 24 hours, and if no alternative arrangement or substitute vessel is offered, then passengers will be entitled to a proportional refund for those cruise days not completed. Except where otherwise expressly stated in these booking conditions, we regret we cannot accept liability or pay any compensation where the performance or prompt performance of our contractual obligations or those of any service provider is prevented or affected by or you otherwise suffer any damage or loss (as more fully described in Clause 10(1) below) as a result of "force majeure". In these Booking Conditions, "force majeure" means any event which we or the provider of the service(s) in question could not, even with all due care, foresee or avoid. Such events may include war or threat of war, riot, civil strife, actual or threatened terrorist activity, industrial dispute, natural or nuclear disaster, adverse weather conditions, fire and all similar events outside our control. (1) We promise to make sure that the yacht charter arrangements we have agreed to make, perform or provide as applicable as part of our contract with you are made, performed or provided with reasonable skill and care. This means that, subject to these booking conditions, we will accept responsibility if, for example, you suffer death or personal injury or your contracted yacht charter arrangements are not provided as promised or prove deficient as a result of the failure of ourselves, our employees or suppliers to use reasonable skill and care in making, performing or providing, as applicable, your contracted holiday arrangements. Please note it is your responsibility to show that reasonable skill and care has not been used if you wish to make a claim against us. In addition, we will only be responsible for what our employees and suppliers do or do not do if they were at the time acting within the course of their employment (for employees) or carrying out work we had asked them to do (for suppliers). (2) We will not be responsible for any injury, illness, death, loss (for example loss of enjoyment), damage, expense, cost or other sum or claim of any description whatsoever which results from any of the following: -‑ the act(s) and/or omission(s) of the person(s) affected or any member(s) of their party or‑ the act(s) and/or omission(s) of a third party not connected with the provision of your holiday and which were unforeseeable or unavoidable or‑ 'force majeure' as defined in Clause 9 above. (3) Please note, we cannot accept responsibility for any services which do not form part of our contract. This includes, for example, any additional services or facilities which your hotel or any other supplier agrees to provide for you where the services or facilities are not advertised in our brochure or on our website and we have not agreed to arrange them, and any excursion you purchase locally. Please also see Clause 16 “Activities and Published Information”. In addition, regardless of any wording used by us on our website, in any of our brochures or elsewhere, we only promise to use reasonable skill and care as set out above and we do not have any greater or different liability to you. (4) The promises we make to you about the services we have agreed to provide or arrange as part of our contract - and the laws and regulations of the country in which your claim or complaint occurred - will be used as the basis for deciding whether the services in question had been properly provided. If the particular services which gave rise to the claim or complaint complied with local laws and regulations applicable to those services at the time, the services will be treated as having been properly provided. This will be the case even if the services did not comply with the laws and regulations of the UK which would have applied had those services been provided in the UK. The exception to this is where the claim or complaint concerns the absence of a safety feature which might lead a reasonable holiday maker to refuse to take the holiday in question. (5) As set out in these booking conditions we limit the maximum amount we may have to pay you for any claims you may make against us. For all claims which do not involve death or personal injury, loss of or damage to luggage or personal possessions, if we are found liable to you on any basis the maximum amount we will have to pay you is twice the price (excluding amendment charges) paid by or on behalf of the person(s) affected in total unless a lower limitation applies to your claim under Clause 10 (6) below. This maximum amount will only be payable where every aspect of your holiday has gone wrong and you have not received any benefit at all from your holiday. (6) Where any claim or part of a claim (including those involving death or personal injury) concerns or is based on any yacht charter arrangements (including the process of getting on and/or off the transport concerned) provided by any sea or road carrier, the maximum amount of compensation we will have to pay you will be limited. The most we will have to pay you for that claim or that part of a claim if we are found liable to you on any basis is the most the carrier concerned would have to pay under the international convention or regulation which applies to the yacht charter arrangements in question (for example, the Warsaw Convention as amended or unamended and the Montreal Convention for international travel by air and/or for airlines with an operating licence granted by an EU country, the EC Regulation on Air Carrier Liability No 889/2002 for national and international travel by air, the Athens convention for international travel by sea). Please note: Where a carrier would not be obliged to make any payment to you under the applicable International Convention or Regulation in respect of a claim or part of a claim, we similarly are not obliged to make a payment to you for that claim or part of the claim. When making any payment, we are entitled to deduct any money which you have received or are entitled to receive from the transport provider for the complaint or claim in question. Copies of the applicable International Conventions and Regulations are available from us on request. (7) Please note, we cannot accept any liability for any damage, loss, expense or other sum(s) of any description (1) which on the basis of the information given to us by you concerning your booking prior to our accepting it, we could not have foreseen you would suffer or incur if we breached our contract with you or (2) which did not result from any breach of contract or other fault by ourselves or our employees or, where we are responsible for them, our suppliers. Additionally we cannot accept liability for any business losses. (8) You must provide ourselves with all assistance we may reasonably require. You must also tell us and the supplier concerned about your claim or complaint as set out in Clause 11 below. If asked to do so, you must transfer to us any rights you have against the supplier or whoever else is responsible for your claim or complaint (if the person concerned is under 18, their parent or guardian must do so). You must also agree to cooperate fully with us and our insurers if we or our insurers want to enforce any rights which are transferred. In the unlikely event that you have any reason to complain or experience any problems with your arrangements whilst away, you must immediately inform our representative (if there is one) and the supplier of the service(s) in question. Any verbal notification must be put in writing and given to our representative (if there is one) and the supplier as soon as possible. If you remain dissatisfied, you should contact our 24 hour emergency telephone helpline (+44 (0)75 02 333 554) at the earliest opportunity. Until we know about a problem or complaint, we or the supplier cannot begin to resolve it. Most problems can be dealt with quickly. If your complaint or problem is not resolved to your satisfaction you must write to us within 28 days of your return to the UK giving your booking reference and full details of your complaint. Disputes arising out of, or in connection with your booking with us which cannot be amicably settled may be referred to arbitration if you so wish under a special scheme administered independently. The scheme provides for a simple and inexpensive method of arbitration on documents alone with restricted liability on the customer in respect of costs. Full details will be provided on request This scheme does not apply to claims for an amount greater than £5,000 per person. There is also a limit of £50,000 per booking form. Neither does it apply to claims which are solely in respect of physical injury or illness or their consequences. The Scheme can however deal with compensation claims which include an element of minor injury or illness subject to a limit of £1000 on the amount the arbitrator can award per person in respect of this element. The application for arbitration and statement of claim must be received by the Chartered Institute of Arbitrators within 9 months of the date of return from the holiday. When you book with or through us, you accept responsibility for any damage or loss caused by you or any member of your party. Full payment for any such damage or loss must be paid direct at the time to the yacht owner or manager or other supplier in question. If you fail to do so, you will be responsible for meeting any claims subsequently made against us (together with our own and the other party’s full legal costs) as a result of your actions. We expect all clients to have consideration for other people. If in our reasonable opinion or in the reasonable opinion of any other person in authority, you or any member of your party behaves in such a way as to cause or be likely to cause danger, upset or distress to any third party or damage to property, we and/or the service provider concerned are entitled, without prior notice, to terminate the arrangements of the person(s) concerned. In this situation, the person(s) concerned will be required to leave the yacht charter accommodation or other service. We will have no further responsibility toward such person(s) including any return travel arrangements. No refunds will be made and we will not pay any expenses or costs incurred as a result of the termination. Many of the services which make up your arrangements are provided by independent suppliers. Those suppliers provide these services in accordance with their own terms and conditions. Some of these terms and conditions may limit or exclude the supplier's liability to you, usually in accordance with applicable International Conventions. Copies of the relevant parts of these terms and conditions are available on request from us or the supplier concerned. If you have any special request, you must advise us at the time of booking. Although we will endeavour to pass any reasonable requests on to the relevant supplier, we regret we cannot guarantee any request will be met. This can include specific room or cabin types. Failure to meet any special request will not be a breach of contract on our part. Confirmation that a special request has been noted or passed on to the supplier or the inclusion of the special request on your confirmation invoice or any other documentation is not confirmation that the request will be met. Unless and until specifically confirmed, all special requests are subject to availability. We regret we cannot accept any conditional bookings, i.e. any booking which is specified to be conditional on the fulfilment of a particular request. All such bookings will be treated as “standard” bookings subject to the above provisions on special requests. If you or any member of your party has any medical problem or disability which may affect your arrangements, please tell us before you confirm your booking so that we can advise as to the suitability of the chosen arrangements. In any event, you must give us full details in writing at the time of booking. If we or the supplier of the service in question reasonably feel unable to properly accommodate the particular needs of the person concerned, we must reserve the right to decline their reservation or, if full details are not given at the time of booking, cancel when we become aware of these details. The information contained in our brochure is correct to the best of our knowledge at the time of the brochure going to print. We may provide you with information (in our brochure or website and/or when you are on the yacht charter holiday) about activities and excursions provided by third parties which are available in the area you are visiting. We have no involvement in any such activities or excursions which are neither run, supervised nor controlled in any way by us. They are provided by local operators or other third parties who are entirely independent of us. They do not form any part of your contract with us even where we suggest particular operators/other third parties and/or assist you in booking such activities or excursions in any way. We cannot accept any liability on any basis in relation to such activities or excursions and the acceptance of liability contained in Clause 10 of our booking conditions will not apply to them. We do however accept liability for the negligence of ourselves or our employees resulting in your death or personal injury. We cannot guarantee accuracy at all times of information given in relation to such activities or excursions or about the resorts/area you are visiting generally (except where this concerns the services which will form part of your contract) or that any particular excursion or activity which does not form part of our contract will take place as these services are not under our control. If you feel that any of the activities mentioned in our brochure which are not part of your contract are vital to the enjoyment of your holiday, write to us immediately and we will tell you the latest known situation. If we become aware of any material alterations to resort/area information and/or such outside activities which can reasonably be expected to affect your decision to book a holiday with us, we will pass on this information at the time of booking. There are no visa and health certificate requirements applicable at the time of printing for European citizens for the arrangements we offer within this brochure. You must be in possession of a full passport. Requirements may change and you must check the up to date position in good time before departure. If you are visiting a European Union country, you should obtain a European Health Insurance Card (EHIC). This may be obtained free of charge by completing an application form available from main Post Offices. This is in addition to travel insurance, not instead of it. It is your responsibility to ensure that you are in possession of all necessary travel and health documents before departure. All costs incurred in obtaining such documentation must be paid by you. We regret we cannot accept any liability if you are refused entry onto any transport or into any country due to failure on your part to carry correct documentation. If you or any member of your party is not a European citizen or holds a non European passport, you must check passport and visa requirements with the Embassy or Consulate of the country(ies) to or through which you are intending to travel. If failure to have any necessary travel or other documents results to fines, surcharges or other financial penalty being imposed on us, you will be responsible for reimbursing us accordingly. Please note, the published information and prices may have changed by the time you come to book your arrangements. Whilst every effort is made to ensure the accuracy of such information and prices at the time of printing, regrettably errors do occasionally occur. You must therefore ensure you check all details of your chosen arrangements (including the price) with us at the time of booking. We regret we are not in a position to offer you any assistance in the event of delay at your outward or homeward point of departure. Any airline concerned may however provide refreshments etc. We cannot accept liability for any delay which is due to any of the reasons set out in Clause 10 (1) of these booking conditions (which includes the behaviour of any passenger(s) on the flight who, for example, fails to check in or board on time). In addition, for these bookings, we will not be liable for any delay unless it has a significant effect on your arrangements. Please note, it is the requirements and standards of the country in which any services which make up your arrangements are provided which apply to those services and not those of the UK (unless specified otherwise – eg RYA courses operated abroad). As a general rule, these requirements and standards will not be the same as the UK and may sometimes be lower.